You can add additional line items, discounts, promo codes, address, change the billing date and more to unpaid or open invoices on PayWhirl. If you need to make a change on an upcoming invoice, you can do so easily from the invoice details page in your PayWhirl account. If you navigate to Main Menu > Invoices > Manage Invoices you can see all of the invoices in your account. If you click the "view" button next to an upcoming, unpaid invoice, you can edit it to make any necessary changes before it processes. 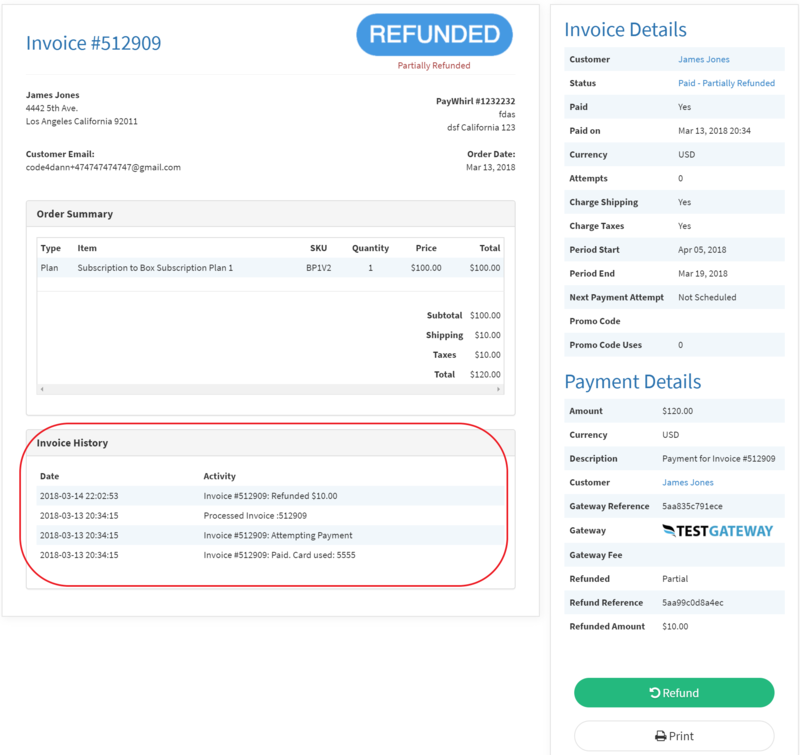 The invoice details page contains all of the information about the specific invoice, including any line items, the processing date, coupons applied, etc. Products, Services, and Fees are the types of line items you can add to an invoice. Each type of line item acts a bit differently depending on your selection. Fees - Sales tax & shipping NOT charged. Discontinues after an invoice has been paid. Also, if you add a line item with a negative number, it will subtract from the total, which can be used for discounting or partial refunds if needed. If you edit the address or profile on an unpaid invoice before it's processed and orders generated at the time of processing WILL have updated information. NOTE: Changing the "Process Invoice On" date WILL NOT change the customer's billing cycle, it only changes the specific invoice you modify. 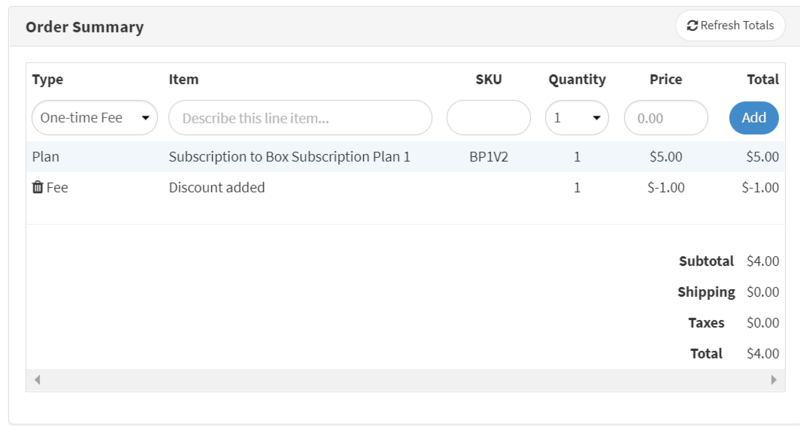 On the right side under "Invoice Details" (on the desktop) you can view the details of the subscription that created the invoice. Most of the fields here can't be changed here because the subscription plan controls them. For example, tax and shipping rules are displayed as 'yes' or 'no' but can't be edited. If you want to change either on future invoices, you must change the rules of the PLAN that created the invoice. NOTE: CHANGING THE SETTINGS OF A PLAN WILL EFFECT ALL CURRENT & FUTURE SUBSCRIBERS OF THE PLAN BUT WILL NOT CHANGE THE INVOICES THAT HAVE ALREADY BEEN GENERATED. If you want to change invoices that have already been created, you will have to edit the pre-existing invoices manually. Changes to the plan settings will only apply to future invoices that are created. 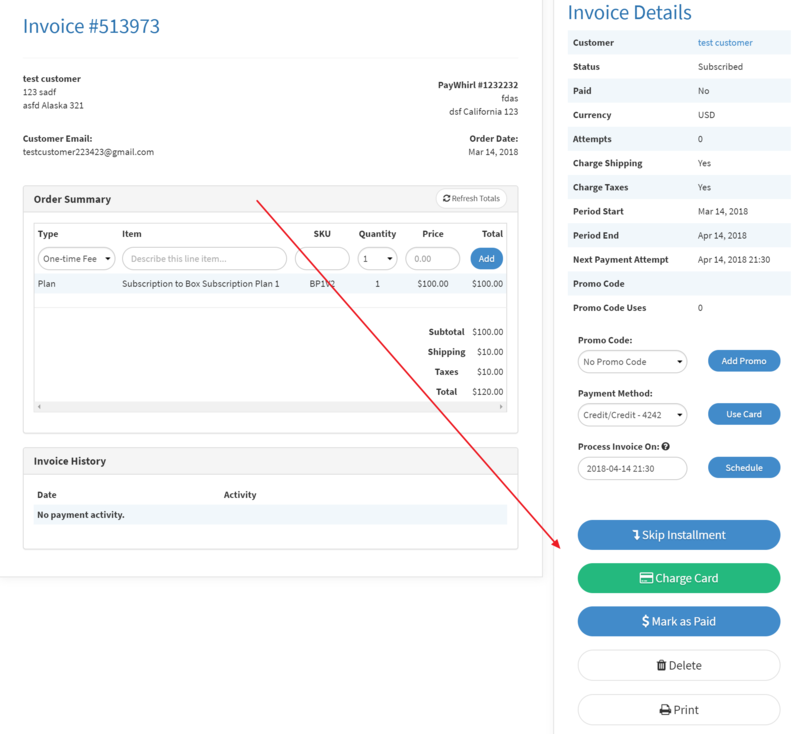 If you need to bill an upcoming invoice immediately, you can click on "Charge Card" anytime to process the invoice immediately and generate the next one. If a customer paid by another means (e.g. in person transaction or mailed a check) you can click "Mark as Paid" on any invoice to generate the next one. If you want to skip the installment, click 'skip installment' which will not charge the invoice and will mark it ask 'skipped' in the system. To enable this setting, go to the Account Settings > Advanced Settings. This will also allow customers to skip on their own instead of canceling. The "Delete" button will completely remove the invoice record from your account. If it's tied to a subscription, it will also delete the customer's subscription. The "Print" button will format the invoice in a printer friendly, downloadable .pdf format. You can select a custom template in the Account Settings > Advanced Settings. Invoices also have a section that will log any changes that were made by either you or the customer. This could be a rescheduled invoice, a promo code getting added or removed, declined payment information. NOTE: Paid invoices cannot be edited, however they can be refunded.